They say if you do what you love in your career, it won’t feel like work. They are lying. It’s work alright and I believe it should feel like work, because what you do should have a purpose and it should be challenging enough that you feel tested and pushed to succeed, yet easy enough that you enjoy it and keep striving to be better at it, whatever it is. This column? This is pure love. Heart and soul. And it’s because of you, reading it right now, that this is the most fun I have ever had in my career. It wouldn’t have happened had it not been for this newspaper. 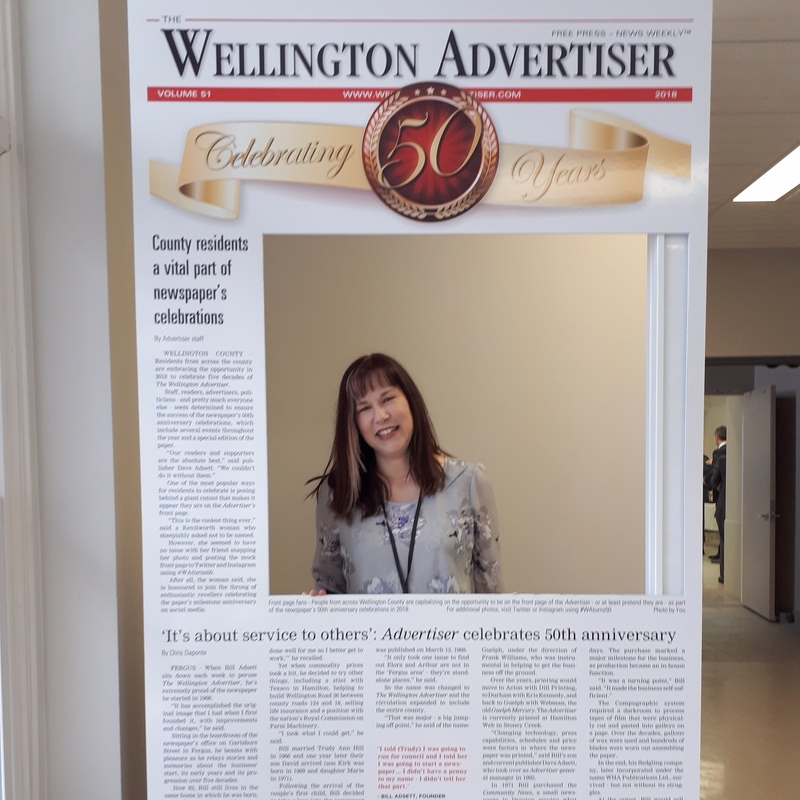 As the Wellington Advertiser celebrates its 50th anniversary, it comes to mind that there are many things that I enjoy about being a part of this independent, family-owned, award-winning newspaper. First, it’s older than I am. Not by much, mind you, but as I’m at an age where everything and everyone seems to be younger than me, I’m good with anything being older. 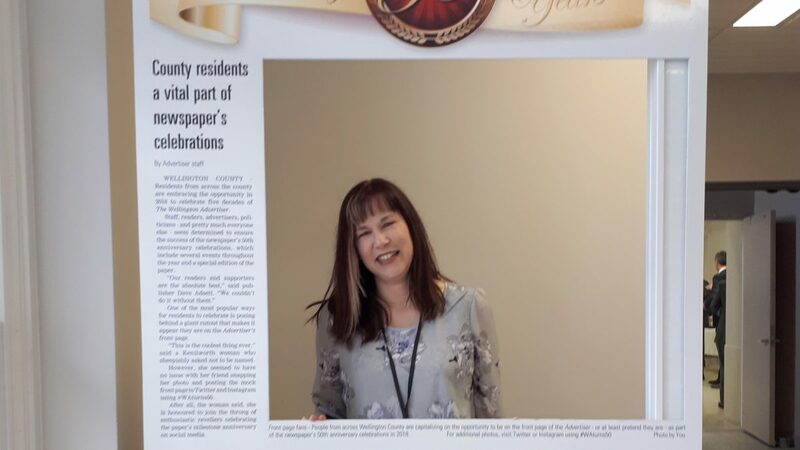 Here’s to longevity: the newspaper’s and my career within it. (But skinny jeans? You can go anytime). Nine years in, this column has been a weekly deadline that has kept me on my game (and my darling Carpenter on his). In a time where women continue to seek equality and justice on a variety of platforms, I am very aware that Write Out of Her Mind is a privilege to write. I don’t take for granted that this newspaper gives me a space every week to have a voice to talk about what matters most to me: marriage, parenting, friendship and community. Also chip dip, chip trucks and the need for fat pants. It’s important to be authentic and chubby. Own it, I say. What I am most grateful for is you, the readers. Yes, you. 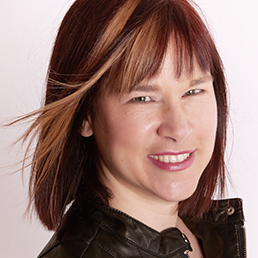 A writer without an audience is a very lonely place to be – and I know, because I’ve been one. You have changed that for me. Whether I am cracking self-depreciating jokes or reflecting on stories of love and loss, we’ve shared some laughs and more than a few tears over the years. If I could come over to your house for coffee and read this column to you personally, I would. (Be careful what you wish for). I look back and realize that my family has grown up in the pages of this newspaper and you’ve been a part of it all. One day, my children will look back through the archives and have stacks of stories to take to their therapist to explain how I messed up their childhood. It will all be there in black and white, organized by dates and editions. Really, they should thank me. I’ve made it easy for them. Fortunately, they can’t sue me. If I haven’t embarrassed them yet, I think we’re okay. Writing this column is the hardest part of my job and the easiest too. It’s work in the best sense of the word. Time flies when you’re having fun. That’s okay with me. I didn’t choose writing, it chose me. But I am grateful to have this space and a publisher that lives up to its word to cover the county, and do so with integrity. Community isn’t just where you live, it’s how you live. Wellington County is my home for this reason. This newspaper is my home, too.